Earl Eisley’s dog sleeps soundly at his feet in his office. Outside of his window grows a bed of colorful marigolds. His office is like that of a normal businessman’s office-various papers and files: obviously the office of a busy man. When you look around, you realize this isn’t just a typical office. This room was in previous years a bedroom of the Eisley family home. It was there in this home that he was raised as a small child. This family home is in the foundation of what is known today as Eisley Nursery, member of the California Association of Nurserymen. In this family home and business you see a certain quality of life. A feeling of hard work and togetherness. A sense of comfort and ease. This nursery and its family are motivated by the aspiration of improving the quality of life. Giving gardeners the opportunity of a wonderful quality of life is something that Earl takes pride in. He believes that each of Auburn’s big backyards should have a garden, where quality fruits and vegetables grow. “Nothing like homegrown fruits and vegetables,” he said. With excitement and awe, he recalls creating 16” heads of cauliflower and broccoli. “You can’t find anything like that in the markets,” he laughs. Eisley Nursery entices gardeners by offering quality products. There at the nursery, they trial various plants, vegetables, and fruits growing several F1 hybrid varieties. They take pride in knowing that they supplied the best tomato or the best primrose, or offered a new variety of fruit tree that can’t be found in the markets. This standard of quality that goes above and beyond is what Earl credits for success of the nursery for so many years. During the 1930’s, the Great Depression affected so many, creating the necessity for families to find any avenue of supplementing their income. Henry and Lila Eisley’s house was, and still is, located on Auburn’s Nevada Street. In the 30’s, Interstate 80 was not yet built, leaving Nevada Street, to be a main thoroughfare from Nevada County. Many residents of Nevada County weren’t suffering from the devastation caused by the Depression. Gold mining continued in the foothills, allowing for miners to maintain a sufficient income. They used Nevada Street as a way to get to Sacramento to do their shopping. Lila noticed the traffic flowing past her house and saw an opportunity to earn some extra money for her family. While Henry had a rural route with the post office, as well as a chicken ranch, Lila began to sell the pansies that she was growing in her front yard. The miners would stop on their way home from shopping. 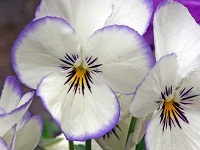 The Pansy Nursery was established. What started as a simple operation of homegrown-pansies taken home in a wooden fruit basket to local homes became what is known today as Eisley Nursery. The nursery grew in size and diversity. By the late 30’s, the family began to build small greenhouses and to grow geraniums. Each decade to follow brought further expansion. By 1951 Earl and his brother Harvey were out of school. They had been working on their families nursery and ranch since early childhood. They decided it was time to bring down the chicken houses and replace them with greenhouses. Bedding plants began to grow in abundance, creating the need to move beyond their position as retailers only. What they didn’t have the room for to sell at the nursery, they chose to wholesale to other nurseries. The wholesale market became the nursery’s primary emphasis at the time. They eventually added a delivery system that took the products out to the retail nurseries. Eisley Nursery is responsible for several “first” in the nursery industry. In the early 70, the Eisley Nursery had the first tomato vegetable food formulated, which helped alleviate blossom end rot of tomatoes. C.A.N. Associate Member E.B. Stone produced the fertilizer, which is still sold at Eisley’s and several other locations. They are also one of the first to sell tomatoes and sunflowers in 4” pots. With Henry’s death and Harvey’s retirement in 1978, the Eisley Nursery fell into Earl’s hands. Soon his own children—Jim, Bill, Susan and Earlene, began to join the nursery staff. Also employed are Earl’s wife Linda, Susan’s husband and daughter, John Flohr and April Messerall, Bill’s son's, Hank and Clifford, and Earlene's daughter Phoebe. In the 1990’s, the growth and popularity of large retail centers, like Walmart and Home Depot, created the necessity for continual expansion and creativity. The Eisley family chose to stick with the “mom and pop” style that the nursery was based on, both in their own retail center, as well when choosing nurseries to sell to. Eisley Nursery always works to improve the quality and variety of their bedding plants in order to continue the emphasis on the wholesale market. At the same time, they strive to maintain the success of their retail-oriented business, as well. Earl believes that the nursery’s retail center and gift shop will continue to be successful because of the healthy growth of the population and business in Placer County. The free popcorn, tea, and coffee doesn’t hurt to bring in the customers either. Eisley’s Nursery hopes to continue their success by continuing to strive for a higher quality of product. They will assist their customers by offering several gardening clinics with topics such as fruit tree maintenance and rose maintenance. The nursery also publishes the Garden- Gram, a free monthly newsletter that announces their upcoming clinics and gives customers tips for successful and creative gardening. The Garden-Gram is published by retired colleague, Don Yamasaki, an associate member of C.A.N.